Safety warning High sharpness and suitable for direct printing. You need to get an import permit from Ministry of International Trade and Industry tog get your item if your item is more than 1000 MXN. [ Country of Manufacture ]. Japan Usage Item. the manufacturer will change contents, date and quantity for sale. Looking forward to your orders! [ Li-ion Battery ]. We do our best for you!! [ Condition ]. 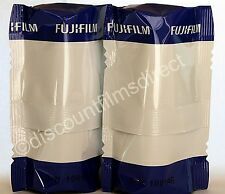 Official FUJI FILM reversal film VELVIA 100 (120 sizes). 12 pictures taken 5 Rolls 120 VELVIA 100 EP NP 12 EX 5. In order to incorporate green-based color correction layer (fourth color sensitive layer) and realize faithful color reproduction. Condition is New Other. 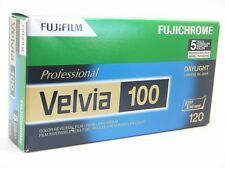 Fuji Velvia 50 120 Roll Colour Reversal Slide Film. Superb grain quality, vibrancy and resolving power. Compatibility 120. Colour saturation has always been an important feature of Velvia 50. 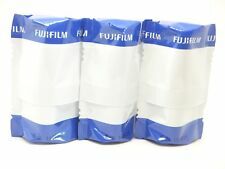 5 x FUJI VELVIA RVP 100 120 CHEAP SLIDE FILM SHORT DATED DATED 2019-04. Format : 120 Roll Slide film. ÃÂ© jaz-uk. Is one of the UK's leading on-line suppliers. FUJI VELVIA 100. COLOUR SLIDE FILM. This is a very versatile and all round Pro. Very fine grain with strong, vivid colours. E.6 slide process - processing not included. Colour saturation has always been an important feature of Velvia 50. Format : 120 Roll Slide film. © is based in Romford East London. Is one of the UK's leading on-line suppliers. Fuji VELVIA 100. 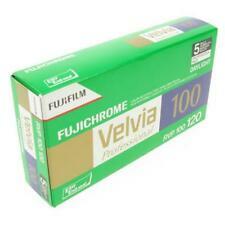 This is for ONE 120 film of Fuji Velvia 100. Colour SLIDE film. 120 Slide Film. Colour saturation has always been an important feature of Velvia 50. Format : 120 Roll Slide film. © is based in Romford East London. Provides color image stability equal to that of RVP 100F and can be push-processed up to 1 stop with excellent results and little photographic variation. Color image storage permanence (anti-fading characteristics) equal to that of RVP 100F as a result of new couplers. 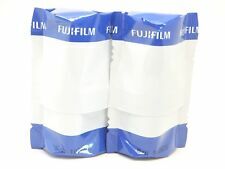 This film was introduced worldwide in August/September 2005 not to be confused with its predecessor FUJI VELVIA 100F which was introduced in September 2003. The film is fresh. 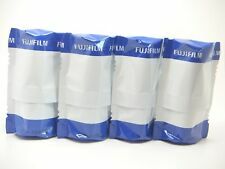 Film Format / size Film type Number of exposures per roll Film condition 6 cm x 6 cm 12 Exposures. Expiry Date 6 cm x 7 cm 10 Exposures. Product model number: 120 VELVIA 100 EP NP12EX5. ISO sensitivity: 100. 100% official genuine product. Junk: No works For Parts. Very Good: Heavy marked but works ok. Excellent: Show signs of moderate use. FUJI VELVIA 100. COLOUR SLIDE FILM. This is a very versatile and all round Pro. Very fine grain with strong, vivid colours. E.6 slide process - processing not included. 1Single Film.